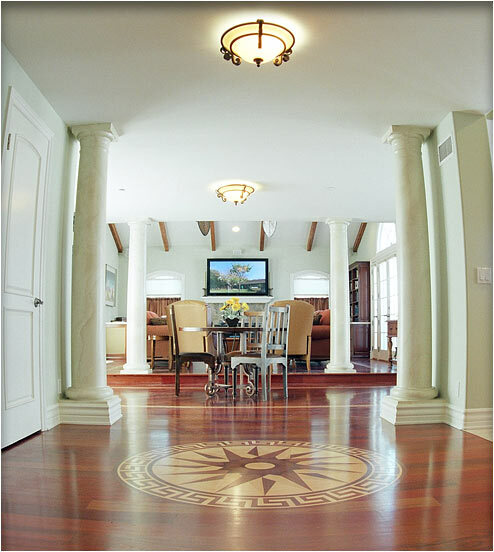 Larger Project 7-2, Floor Medallion » Roger Perron Inc. This view speaks for itself, with lots of space and a full view of the TV from many feet away. The floor is Brazilian cherry with a clear finish. The floor medallion is a compass pointing appropriately north. The theme is that one is on a large boat, guided by the compass, since the home has wonderful views of the ocean. We also installed the wood beams shown beyond in the family room remodel.